So here we are again the year is going so fast; and what a 2018 it has been for us so far and we are only 6 weeks in. Firstly January what a busy month; it saw us continue 2 of our confidential investigations both equally interesting and we are now reviewing and collating all our findings. Thankfully we have enough experienced investigators as one night both investigations were at the same time; so 1 team headed West and the other East. Having years of experience, coupled with Ghostology and ASSAP the team really are outstanding and evolving and growing constantly. Time has gone so fast this year and what a year its been. Every month has been non stop and why should October be any different? We are about to finalise our findings. The question is who is brave enough to go back? 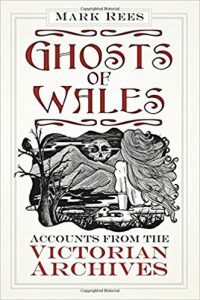 On the 28th we joined Mark Rees in Swansea for his 2nd book launch of ‘Ghosts of Wales’. We listened to some fantastic stories from his book retold by Mark and guest storytellers. It got us all in the Halloween spirit! We were also given some time on stage to talk about our group and how we approach investigations. Sarah and Leanne shared an unexplained personal experience that they had on the same investigation a while ago. We have been working on some great upcoming locations and hope to secure some dates soon. We’ve been approached to carry out a private investigation however; following further discussions we felt the location wasn’t suitable for a number of reasons to carry one out. Our 2 key long term locations, we are looking at finalising a selection of dates for both locations to take us through the next 6 months. So a busy 10 months and a busy 6 months are to follow. Special thanks to all the team at Cymru Paranormal without you all we wouldn’t achieve what we have to date. Last saturday a few of us headed down to Swansea to talk at the book launch of ‘Ghosts of Wales’ by Mark Rees. The location was The Grand Hotel, Swansea. Mark also presented Cymru Paranormal with a signed copy of his book as a thank you. After the event we were asked many questions by interested people. We look forward to the next opportunity we have to talk about Cymru Paranormal. Marks book will be released on 12th October 2017 please see our books page to purchase a copy. We have had a lovely summer catching up with family and friends. We have still been working hard in the background on lots of exciting paranormal things that are coming up. We all hope you have had a great summer and are ready for the spooky season which is almost upon us. How has it become the end of July? This year has absolutely flown by for us, it only seems like a week ago, we were forming the group and since then we have been swept off our feet. So what has been happening for us since our last blog? The we ‘can’t share’ is fantastic for our future, and will assist us in continuing to be a successful group with first class investigators. In June, Cymru Paranormal were invited on to Ghost Chronicles International, a radio show across the water, hosted by Ron Kolek and Steve Parsons, both are well known in the field. The show lasted an hour and boy, oh boy, did they make Sarah work. We listened to the show live and have listened since, and must say Sarah faced some tough questioning from both hosts and handled it well. We think she deserved a good stiff drink after it, not sure if she took to the bottle but she certainly deserved one. The show is aired live at 8pm (UK time) and is definetly worth tuning into, they always put the shows up on the podcast link, if you can’t tune in to download and listen to another time. I often download and listen to the show in the car. Follow the link below and you will find a number of podcasts that are very interesting including ours. Due to our success we have closed our books to membership for the moment. The support we have received has been outstanding; and for the right investigator we would look at opening up membership, however with a base of 31, it is important that we retain small professional approach. We don’t want to be about the numbers, but focus on quality and ensuring our standards are maintained. In June, Four of our investigators attended the ASSAP training weekend, they will each have another course to attend later this year or early next, this is great news for Cymru Paranormal as we will have 8 fully trained investigators. We have been fortunate to visit a couple of premises reference carrying out investigations; one of which was unsuitable for us and therefore withdrew. We do have one, where we are considering carrying our investigations and we will keep you posted. The end of July however, saw us return to the delightful Bedwas Workmens Hall, this really is a great building with much history. The building has many reports of activity, due to the size we are breaking the investigation down into chunks and focusing on a couple of areas first. We are so fortunate to be granted access to this building to carry out a long term study/investigation. Thanks must go to the trustees who do an outstanding job managing the hall. We decided when we were forming, that August would be a quiet month for us due to holidays, therefore during the month of August we will spend some time catching our breath, and spending time with family. We do however have planned a wonderful day where we are all getting together for a BBQ in a wonderful Country Park. I’m sure the talk will digress to the all things paranormal and hopefully they won’t want to do a Blair Witch experiment in the woods. We also have a couple of reports to compile, so it won’t all be sunshine and beaches; which is just as well as the weather forecast isn’t looking great. To you all, please have a wonderful Summer, enjoy, relax and most of all have fun, that is what life is all about. 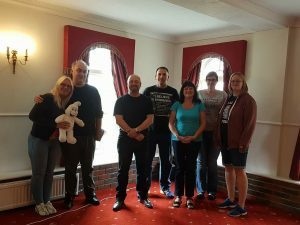 On the 24th June, Four members of Cymru Paranormal ventured to Wooton Bassett for the ASSAP training weekend. Over the two days the ASSAP speakers kept the group enthralled, with discussions and training on techniques in handling various cases and how to plan and conduct investigations. The Saturday evening was spent relaxing and having a good chat about everything paranormal over a few drinks in the bar. Overall we had a fantastic weekend learning new techniques and improving on existing skills. We would highly recommend the training day and look forward to attending the next ASSAP conference Seriously Strange on 9th and 10th September in Bath. For more info click here. May was a busy month for Cymru Paranormal with ASSAP Seriously Monstrous and our long anticipated Ghostology Study Weekend. Steve Parsons will be a familiar name to many in the Paranormal world, not least because his books are at the top of our recommended books page. He is one of the founders of Para.Science, one of the most respected psychical research and investigation groups in the UK, and has been described by the Wall Street Journal as ‘The Gold Standard of Ghost Hunting’. To give a full run down of his experience, achievements and influence on the study of the Paranormal would take more time and space than I have in this blog so for those unfamiliar with his work, please take a look at his webpage. It started at 11am on the Saturday and covered a number of topics including – What exactly is a ghost? Ethics and Interview Techniques, The History of Ghost Hunting, lessons from earlier ghost hunters and evidence. After a trip to local pub for food, we returned for our evening investigation. Given the size of Bedwas Workingmans Hall it was decided that the two teams would investigate the education section downstairs and the other team would investigate the upstairs theatre and backstage area. Sunday kicked off with a discussion of the previous evening. We then moved on to cover EVP, Sound, Photography, Video and other Equipment. Due to the depth covered on these topics I’m not going to go into a great amount of detail, everything is covered in Steve’s book Ghostology. It is incredibly difficult to do justice to how informative, interesting and thought provoking Ghostology was. If you were unable to make the study weekend this time I highly recommend attending it in the future if you get the opportunity. In the meantime it’s well worth picking up a copy of Ghostology and Paracoustics, see the books page for links, and giving them a good read. A number of us headed over to Bristol for the day, to attend the cryptozoology conference being hosted by ASSAP. A number of outstanding guest speakers were due to appear for the day, unfortunately on arrival a number were unable to attend, however, Norie did a great job of quickly filling those spots so all was not lost. Now, in true IT failure style, the original blog that was written was deleted and recycled after being emailed, big failure as the attachment was not attached. So you have a very short version of the day as the notes were shredded at the same time, and as many people know writing for the second time isn’t wonderful, so apologies for that. The day however was interesting for those that couldn’t make it, with talks from Richard Freeman, Richard is well versed in all things crypto, and also worked as a zoologist. Richard took to the floor twice, first talking about his great expedition where he had to leave the mountain half way on the expedition and also lost his camera, which sadly contained lots of his images captured over the years. Richard then treated us to a talk on Dragons, now being a Welsh Group with a Dragon for our logo we were interested in this talk. The history of dragons goes way back to 829AD, Richard gave an excellent talk with pictures of dragons from across the world. Jackie Tonks gave a fascinating talk on her travels to North West America tracking Bigfoot or Sasquatch as many call it. Jackie is well known in the crypto world and is due to be going on an expedition with Richard. Jackie sadly couldn’t provide us with evidence of her encounter with Bigfoot and although a credible witness, we would of loved to have seen it. Hopefully, Jackie will be able to capture Bigfoot for everyone, as she has seen two whilst trekking for months on end. In addition we had a talk on Giant monsters from Doctor Who from Nick Walters, it was clearly apparent he knew every monster that Doctor Who has created over the years, good and bad. The day sadly came to an end, and it was time to head back over the bridge, to the land of the dragons. Thanks to Norie from ASSAP and Sherilley from B.S.R.P.I for hosting the day and managing check in and the speakers so well. We will see you at Seriously Strange in September. If anyone wishes to book the conference is over two days, you can attend for 1 or 2 days, follow the link here. Doesn’t time fly, who would have thought, we would be writing up our month again so quickly? We don’t know about you; but time is moving so fast it’s hard to keep up. So what have Cymru Paranormal been up to? On the 1st April, a number of us travelled over to Bristol to the ASSAP conference ‘Seriously Investigated’ a number of us as members as well as NRPI status holders, however, non members can enjoy their conferences and they are all priced very well so won’t necessarily break the bank. The line up was interesting including well known household names such as Dr Ciaran O’Keeffe; Steve Parsons and Trystan Swale all have spoken many times previously and have always been engaging. Mark Davey Lead Investigator and Chair of BSPRI a group with a long standing relationship with ASSAP being one of their long term affiliated groups opened the conference and welcomed everyone. Ciaran O’Keeffe was first on the podium with a very interesting talk which included some of his recent studies which include Eye tracking, this really got the audience listening and keen to purchase a pair of these wonder goggles, then he hit us with the price….ouch…however; all was not lost as Ciaran made an offer to the audience that was very interesting, and we wonder how many will take him up on this incredible offer? Watch this space…..
Next Andy Thomas gave another enthralling talk, Andy is an author of many books including ‘The Truth Agenda’ his talk touched on crop circles and his experiences whilst carrying out a number of investigations and research into the topic, really kept everyone bright eyed and bushy tailed. Many in the paranormal world have heard of the ‘New’ Paranormal Investigation TV Show ‘Ghost Chasers’ it is shown on Insight Channel 564 the two investigators are well known to ASSAP members and many who have held investigations/events at Woodchester Mansion. This session was a Q&A session with Steve Parsons being the interviewer. Steve gave the audience the opportunity of asking a number of questions to Paul and Chris, who responded to all questions in a positive manner no matter how controversial they were. Our Audrey posed one question to them “Do you wish you had more control over what was shown”? Chris and Paul answered, yes; however as it was a TV show they obviously have editors etc who choose the clips. What they did say was that they were trying to make a show that was different and show the sceptical approach to investigating and hoped that they have managed to provide a balanced view. Steve Parsons was next to the floor and talked about ‘Smarter Ghost Hunting’ many investigators like their kit and Steve’s talk was pointing out that these days the technology of certain mobile devices is so powerful, that ‘Investigators’ could effectively reduce the amount of kit by utilising their mobiles. Steve went one further and gave evidence to back up how the information from these devices is more powerful than some of the stand alone equipment available on the market. As a group, we don’t have much kit, what we have invested in also isn’t used on all investigations, as many are aware, no two investigations are the same, what we do use, we like to ensure we can measure and have adequate controls in place. Therefore we have never turned up with a boot of flight cases and in fact we don’t own a flight case. How strange are we? Kevin Kerr or Kev Kerr of Pararationlise as many know him by, gave a very interesting talk on the difference between a paranormal investigations and ‘evestigation’ how spot on he was, so many call an event and investigation these days. It is worth a look, it’s only 20 minutes long. Joanne Tansy and Angela Williams of ‘Eerie-Encounters Paranormal Group’ gave a talk on Chingle Hall, many hadn’t heard of the hall however, after the talk I am sure many would be looking it up. Joanne, had spent many hours at the hall, as a tour guide and had many stories to tell of strange goings on. Sadly Joanne and Angela broke the news to the audience that the hall has been closed to the public now for a number of years as it moved into the hands of a private occupier. Trystan Swale gave a talk on the Ancient Ram Inn, a location that everyone in the paranormal world has heard of. Was Trystans talk controversial? Yes it was seen by many as just that, and we feel Trystan wouldn’t be offended at this; however; his talk was seen by many as an accurate portrait of this well known hunt ghost hunting venue. 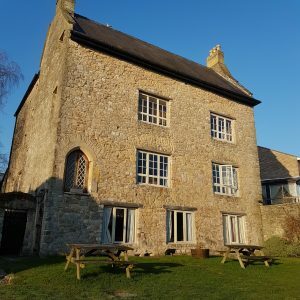 Chris Howley gave an interesting talk on Woodchester Mansion, which also included some of his own personal experiences encountered at the property over the past 12 years. Chris has spent literally thousands of hours at the mansion over the years and knows the property, inside and out. 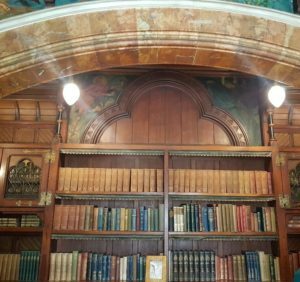 Chris has also seen literally hundreds of paranormal groups at the mansion, carrying out various types of investigations as well as many TV shows which also include The One Show. For those that haven’t been to Woodchester, it is worth a visit; based remotely and unfinished it is of Victorian Gothic style and Grade I listed, it is definitely worth a visit day or night. Sadly the day was nearing the end, but no ASSAP conference would be the same without a talk from the one and only C.J Romer. 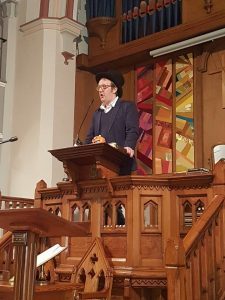 C.J gave another wild talk of his career whilst ghost hunting, and how not to investigate. C.J with his notes in hand had the audience laughing with his tales of Ghost hunting. What was it he said to our Rachel and Dave? Oh we couldn’t repeat on this blog, but we did all laugh later. C.J eventually discarded his notes as he was in full flow, when sadly the time was up and Mark who opened the conference, now needed to close it. Many thanks ASSAP, Norrie and all your speakers, as well as Mark Davey and his team at BSPRI who assisted in the well run event. We all had a great day which was finished off in a local pub where we digested and talk through the day over a good meal and a few drinks. See you all on May 21st at the Seriously Monstrous conference. On April 22nd a small group of Cymru Paranormal Investigators joined BSPRI at Newbridge Memo for an investigation. The Newbridge Memo is managed by Colin and Darren of Truthseekers, and although you do need to pay to investigate the building, the cost has been kept to a minimum so that groups who are serious about investigating like ourselves can do so without breaking the bank. We all met before heading over to the hall which was opened in 1908 and has recently undergone a major transformation which should ensure the building remains in use for all for another 100 years. Once inside the memo, you quickly realise this is a tardis, what looks small from outside houses two stages. We won’t discuss our findings from the evening; however; we have some key areas that we will be going back to investigate. If any small groups are interested in hiring the venue you can contact Colin or Darren on Facebook via the Group Truthseekers. Many thanks to BSPRI for allowing us to share the investigation with you; it was a pleasure investigating alongside a group with very similar methodology. Back in HQ it hasn’t been a quiet month; lot’s of work has been going on behind the scenes in preparation of the ‘Ghostology’ weekend; which our investigators are all looking forward to. We have also been looking at a location for a confidential investigation; which will in turn become a long term study for the group, all being well this can be added to our existing locations for our long term research project. That is all from us this month; until next time thanks for reading. I’m sat thinking what has happened in March? Well I can tell you the grass isn’t growing under the feet of Cymru Paranormal, it’s been another exceedingly busy month. 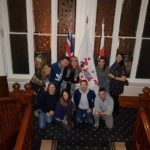 Firstly we ran a private ‘Ghost Hunt’ style event for a great bunch of people, we made a commitment when we formed that although we will be carrying our serious research and investigations, it was important to have several arms to the group. We welcomed the 9 guests for the evening and we carried out a number of experiments, many had never been on any kind of paranormal style event previously, therefore it was important that the evening was managed in a way as not to scare anyone but also not to mislead them. The night came to an end and everyone had a great night. On top of this, we have been fortunate to carry out another confidential investigation; this one is going to be over a long period of time. We have been granted exclusive access to the location for a 12 hour period which over the centuries has had a colourful yet dark past. What will we uncover? Well time will tell by ensuring strict controls are in place anything that is uncovered will stand up to scrutiny. This month saw us receive some feedback which has really boosted us and shows there really is no point in pretending something is something that it isn’t. Aside from doing what we do best, we’ve been busy behind the scenes, researching and collating information and of course our monthly meeting. April looks set to be as busy; so far we have 12 of us travelling to Bristol for the ASSAP Seriously Investigating conference on the 1st. Keep an eye out here for our write up on what looks to be an outstanding day, with lots of great speakers. I would also like to give special thanks to the CP team who once again have proved what a superb team we are, we wouldn’t be anything without you all. Well what can I say? It has been a whirlwind year so far. Our feet have hardly touched the floor. February, saw us conclude a confidential investigation, having carried out many investigations previously, what was different about this one? Well for starters we had exclusive access and the location was very secluded. We can’t share our findings with you as they now belong to the location. The investigations were certainly interesting and we would like to thank the investigators who took part, as they were long nights but I think they all agree it was worth every minute. February also saw our first outdoor investigation; this was an opportunity for our members to join us who are just starting out investigating, to learn hands on what happens. Unfortunately in great British style, the weather was wet, well wet is an understatement, storm Doris turned up and we had to call the investigation off at the last minute. Thankfully everyone still made it to the meal (in the nice dry pub) and it was a great opportunity for everyone to catch up and meet. So the night wasn’t a complete wash out. I think it’s fair to say, we have an amazing team of members, who are constantly going over and above for the group, and the commitment shown is like a breath of fresh air, it is so nice to stand back and see relationships form from meeting through us. Our ‘Ghostology’ study weekend with Steve Parsons is starting to fill up which is great news. It’s going to be a beneficial weekend which includes the opportunity to investigate with the great Steve Parsons as well, as many know, Steve has over 30 years experience and a wealth of knowledge to share. If you haven’t already booked your place, we would suggest you do so soon. So in a nutshell Cymru Paranormal has had an exceptional start to 2017 with January being busy and February being equally so. So what does March hold for us? Well watch this space and you’ll find out, but I can say that at the time of preparing this blog, we’ve got another packed month ahead. 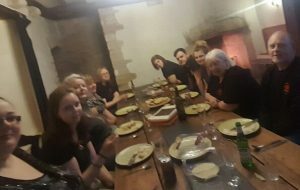 At the very first meeting of what would become Cymru Paranormal the question of where to hold member’s events was raised. One of the first venues mentioned was Llanthony Secunda Manor in Caldicot. Sarah, our Chair and Founder, had already created a list of some possible venues and their availability. Luckily Llanthony Secunda was amongst these and it was available one weekend in January 2017 or a number of weekends in late 2017. However, we had a few other great venues available for late 2017. At which point some bright spark, probably me, said “Could we do it in January? We have almost enough people in this room to make it work.” Sarah immediately sprang into action and contacted the owner. By the end of that meeting we had already decided on our venue for a first event and an outline plan of the action for the weekend. 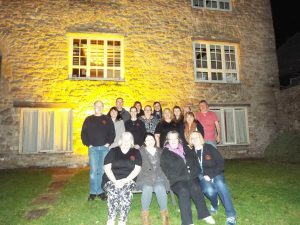 As this was to be the inaugural event for Cymru Paranormal, and the first time many of our members would meet, it was decided that Friday night would be a more relaxed evening, where members, can carry out any investigations they wished and get to know each other and the house, with the investigation/event taking place on Saturday Night. Saturday day would be an opportunity for members to further explore the manor or the many other places of interest in the local area. 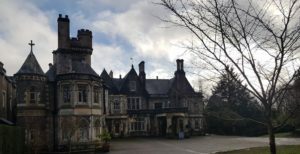 So it was on a rather pleasant Friday in January a number of Cymru Paranormal members set off from our various homes in South Wales to prepare the manor ready to welcome members to our first event. Secretary Rachel and Technician Dave were kind enough to give me a lift. As we arrived at the manor, I was able to finally disentangled myself from the welcome balloons in the back of Rachel’s car. A lovely touch by Rachel who donated them to welcome the members to the Manor. On entering the house I found Sarah already hard at work preparing Chicken Curry, and within a couple of hours we had a roaring fire going in the open fire place in the first floor dining room, Sarah’s Chicken curry and Treasurer Audrey’s vegetarian curry bubbling away on the stove and the Manor decorated ready for the rest of the members. Once the majority of members had arrived we sat down to a fabulous meal. I have to say the dining room of Llanthony Secunda Manor is probably one of the most interesting places I have ever eaten a meal. 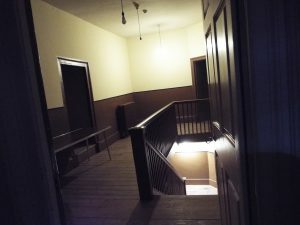 When you book a lot of venues for a paranormal event or investigation you get a list of dos and don’ts, some of the more common ones are things like no Ouija boards in certain rooms or the entire venue. 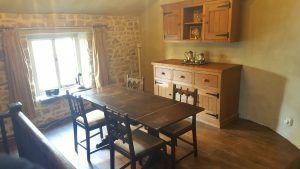 With Llanthony one of the rules is do not move the dining room table or benches, this is because they were made for the floor. Walking up the stairs from the kitchen you can clearly see the reason for this; the legs of both are cut to fit the very uneven floor. I doubt there are many places where you would find yourself sitting on a perfectly level bench that has the leg on one end about five inches longer than the one on the other. 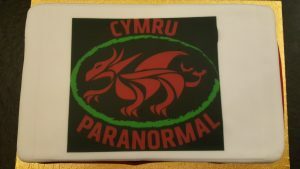 After we all polished off our curries, poppadoms and naan bread it was time for cake, in this case one bearing the logo of Cymru Paranormal a lovely touch and donated by our Chair Sarah. Sarah, Rachel and Audrey gathered together and went live on Facebook, filmed by our Website and Social Media expert Leanne. Unfortunately the Wifi decided to drop out part way so Sarah’s full toast and the actual cake cutting didn’t make it to Facebook. 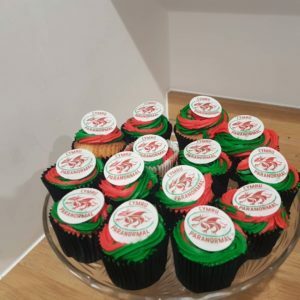 I can’t remember Sarah’s exact words but she welcomed everyone to Cymru Paranormal’s first event only 20 days into our history and with 25 members already. She then proposed a toast to a bright future for the group. After finishing our glasses of bubbly, also kindly donated by our Chair Sarah, we moved to the ground floor sitting room to chat and shoot Ghosts. We even captured our first Ghost on film for our Facebook page. The last four members, including myself, finally finished discussing our paranormal experiences and went to bed at 3am. Saturday morning Sarah and Rachel very kindly cooked breakfast for everyone, on offer were bacon and egg rolls, toast with butter, jam or marmalade and plenty of tea. After breakfast most members went out to explore the local area while Sarah, Rachel and Dave started setting up equipment for the night. I went to Tintern with a couple of members for afternoon tea in the White Monk. This seems to be a bit of a tradition for me as I have been there numerous times returning from nearby St Briavels or other local venues. As the weather was a little cold we decided not to walk up the hill to check out the derelict St Mary’s Church or to visit Tintern Abbey itself both of which are reputed to be haunted and even if they are not they are still worth a visit on warmer days for the stunning views. 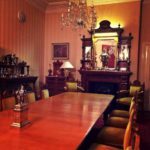 Once all members had returned and we had been joined by a few people who couldn’t make Friday night, Saturday evening started with another meal in the first floor dining room. This time we didn’t light the fire to hopefully reduce the extraneous smell of wood burning and also passed up the alcohol, if anyone was going to report any activity we didn’t want it to be down to the prosecco. After dinner we split into two teams. The first team led by Sarah comprised of Rachel, Dave, 2 members, 2 guests and myself. The second team led by Leanne comprised of Audrey and 6 members. Rather than providing a strict timetable of rooms and activities the house was simply divided into two areas. Members were allowed to decide which specific rooms they wanted to visit and what they wanted to do in each room. Personally I’m a big fan of this approach and think it works well with a few simple ground rules as implemented by Cymru Paranormal. The group I was with started off all together in the living room before a few people moved into the kitchen. Rather than sitting in pitch blackness as many groups do we opted to leave one of the lights in the kitchen dimly on. In the kitchen, which was also used as part of the break area, we had left a number of pendulums, dowsing rods and a planchette for people to use if they wished or to take with them to other areas. Over the course of the night we explored the majority of the manor and undertook a number of experiments in different areas including a joint vigil in the dining room with both groups. Overall, I enjoyed the tone of the event itself. I think with events it’s often difficult to strike a balance between spiritual techniques which many people like and more scientific methods. Leaving the choice of activities open to members is an easy solution to this problem. The group I was with didn’t participate in the spiritual stuff, preferring more to sit quietly and observe the venue. However, this was difficult in a number of rooms as we just couldn’t stop laughing. It’s probably worth mentioning at this point that Cymru Paranormal’s events are not run in the same way as their investigations where they are purely approached in a balanced and scientific way. During one of the breaks we held a raffle with prizes including Chocolates, Candles and books donated by members and £15 towards a future event donated by Cymru Paranormal. 52 tickets were sold. After adding a very kind donation of £5 from a member who was unable to attend the event this gives an extra £57 towards the groups aims. As this seemed popular with members we will continue to run a raffle at future events. After the event finished at approx. 4am members were free to continue investigating if they wished. However, most people decided to turn in for the night. Sunday morning Sarah and Rachel again cooked breakfast for our hungry members and guests before they went on their way back home. After a final check round the final members left the manor at about 11am. Overall a great weekend was had by all and hopefully a few new friendships created. Our Chair Sarah for organising the event, leading one of the teams, cooking two fabulous evening meals and breakfasts and purchasing a donating, champagne and a cake. Our Secretary Rachel for a helping to cook the evening meal on Saturday and breakfast both days also donating and purchasing the other lovely personal touch of the welcome balloons and sign. Our Treasurer Audrey for the fabulous vegetable curry on Friday night. Our Website and Social Media Manager Leanne for leading one of the groups on Saturday and for being official photographer all weekend. Our Technician Dave for all his work in researching, organising and supervising the set-up of the equipment. The members who donated Crystal Pendulums, Dowsing Rods, planchette. I didn’t want to mention names without permission but you know who you are. 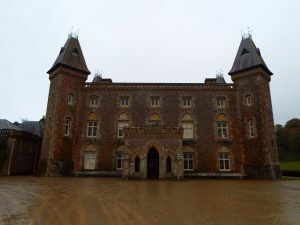 While this blog post is written as Cymru Paranormal’s Official Blogger, all views expressed are my own and should not be taken as the Official View of Cymru Paranormal as a group, unless specifically stated. 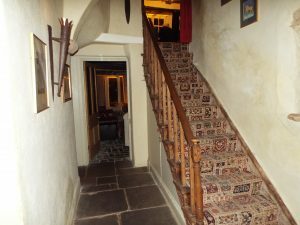 All photos included in this post were taken by Leanne who has kindly granted us permission to use them for Cymru Paranormal purposes and should not be reproduced elsewhere without express permission. 1. As our Committee is named on this website I have/will included their first names and, when they are first mentioned, their position in blog posts. I have not included the names of any other members as I do not wish to do so without their consent. For this reason where I have written member it means a member other than a named committee member. However, where I say Members the majority of times this includes Committee Members and investigators because, when you get right down to it, we are all members. Where I have used Guest it refers to a non-member of Cymru Paranormal, these are normally people known to the group but who are not members. For example we are friendly with a number of other groups across the UK and may invite their members to our events. 2. 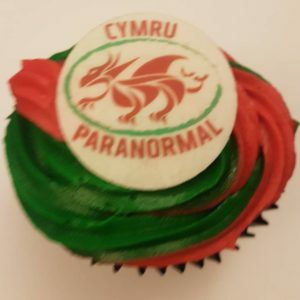 I’m not going to let the cat of the bag yet but Cymru Paranormal do have some really great venues planned for the future so keep your eyes peeled, if you wish to become a member please also check out the member page. 4. To hire the Manor house please see link below.